or washing up. 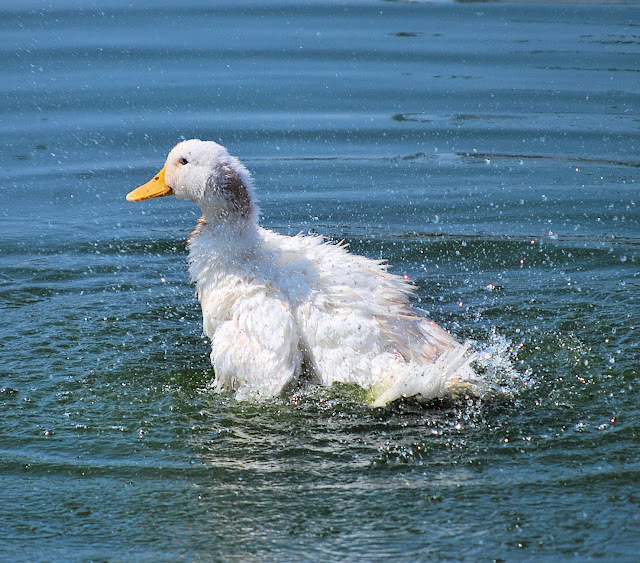 This duck couldn't stop shaking at the lake in Ben Gill Park. I have taken June off from updating iHigh, but I will start updating again on July 1st. It hasnt been abandoned, and I am going to need your help visiting the site. Tonight is 7 on 7 in Kaufman. Look for photos Wednesday and Thursday on Facebook. Have you liked us on Facebook yet? The morning of the 4th is the Flagpole 8K at Norbuck Park in Dallas. I am lucky to just finish a 5K, not sure how I am going to manage an 8K. Fireworks start around 9PM in Ben Gill Park. I signed up to get the Groupon emails a few weeks ago. I haven't found anything that I could use yet. I noticed after signing up, I'm getting a half dozen other coupon/discount emails daily from other addresses. Addresses that I didn't sign up for. I guess Groupon has a side money making business selling email addresses. I have never heard of "Toddlers and Tiaras", its about small kids and beauty pageants. I guess there is a mother/daughter on there from Forney.